This charming fellow will dance along the ground whilst being pulled along. The wooden pieces also make a distinctive rhythmic clicking sound as the wooden pieces knock together on their journey. The alligator encourages children to walk, develop agility, muscle strength and eye-hand coordination. Plan Toys are all sustainably produced in Thailand, Focusing on every aspect of the production process from tree to factory to employees to distribution. The entire company works to be a force for good. 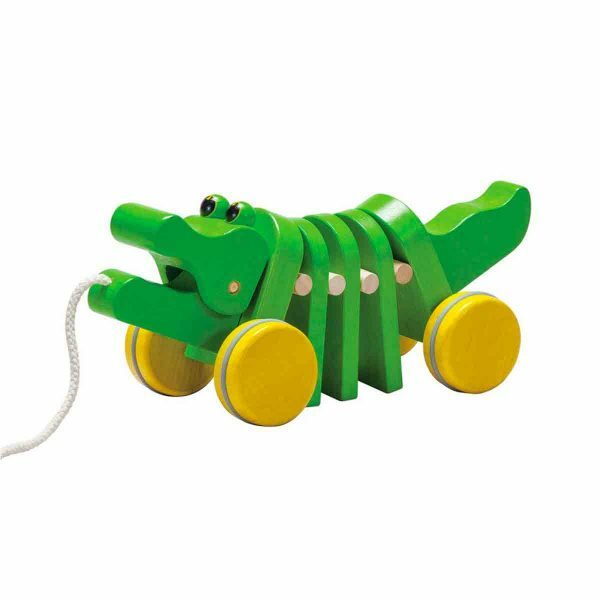 All Plan Toys products are made from natural rubberwood trees that no longer produce latex. No fertilizer is added to soils in three years prior to harvesting to ensure that all woods are toxic-free. To make the wood durable, Plan Toys uses a chemical-free and kiln-drying process. 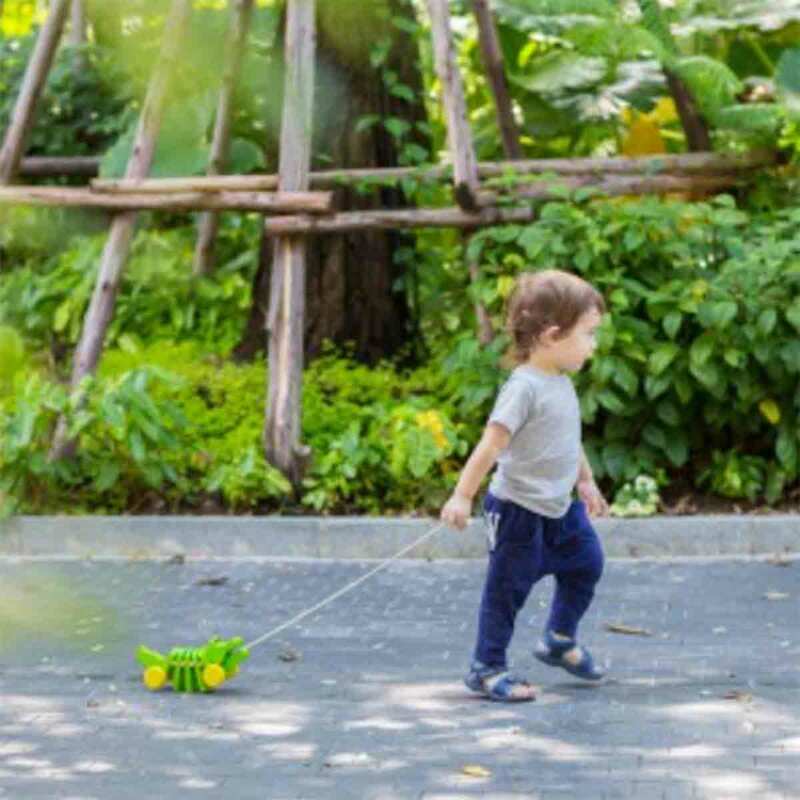 Plan Toys commits itself to find the best eco-friendly materials. The organic pigment is not only safe for our children but also for our environment. Plan Toys do not use chemical dyes containing lead or any other heavy metals. Recycled paper and soy ink are used for our printed materials. Soy ink is more biodegradable than standard chemical inks. This enchanting snail will capture you and your children’s heart as he follows you around. The clever creeping movement is great to watch. If that weren’t enough, he will also help to develop speed, agility, muscle strength and hand-eye co-ordination in your child. Name me another snail that can do all that! 175 grams of flying perfection! Made in California from recycled fishing nets, this frisbee contains 80% recycled content. Providing another solution to keep discarded fishing nets out of the ocean, the Fishnet Flyer is Bureo’s latest positive spin on a harmful waste. Makes a fantastic gift for the speed freak in your family. Watch their eyes light up as the three colourful wooden race cars zip down the wooden track and then make seemingly impossible flips as they make their way down to the bottom of the track using nothing but gravity. Great for developing hand-eye co-ordination. Suitable for car enthusiasts aged 18 months to 5 years. If you need some help with some of those little jobs around the house, then make sure your team has the right kit with this handy tool belt. It includes a hammer, a wrench, a spirit level and a nut and bolt. All sustainably made from rubber tree wood. Best suited to children of 3 and above. Who doesn’t love building a marble run? There’s something deep in the fabric of human nature that loves to see a marble make its merry way down a chute of your own making. When the marble run in question is bright, colorful, well designed and made entirely of sustainable wood like this one, the effect is even bigger. Suitable for kids aged 3 to….70ish. Hours of entertainment guaranteed.